If you’ve been looking for a pair of portable speakers without much success due to your high demands, then the Tweakers Mini Boom Speakers from Grandmax could fit the bill. What makes this more different than other speakers in the market? Well, the Tweakers Mini-Boom Speakers take the less traveled road with built-in retractable cables and an expanding acoustic chamber for richer sound. In fact, Tweakers was an Innovations Honoree at the recently concluded CES show, which goes to show just that it boasts not only looks but brains as well. You get room-filling sound with the ability to stack a bunch of it together, and being no taller than a credit card, it is a snap to tote around with you while you’re on the road. 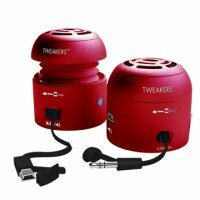 The Tweakers Mini-Boom Speakers will play nice with just about any common electronics device including netbooks, iPods, portable media players and handheld consoles. No idea on the pricing, but it probably won’t burn a big hole in your pocket if you decide to pick one up. I’ve got them, they’re awesome. Much more base than you would expect when you open them up. The rechargable battery works great. Highly recommended. PS the red is best. I just purchased a pair of these speakers. I give presentations using my computer to groups of 10 to 30 people. These speakers worked great. The sound was loud enough at half volume and there was no discernable distortion. FYI They have an internal rechargeable battery that is said to last 2 to 3 hours on a charge. It is charged through the USB port of your computer. It does not appear that the battery is replaceable, but at $19.95 it might be cheaper to replace the speakers than the battery.